Welcome to the new internet home of Grancharova Boar Hunting. We are excited that you have stopped by our website to learn more about our fine history of guided and non-guided boar hunts. 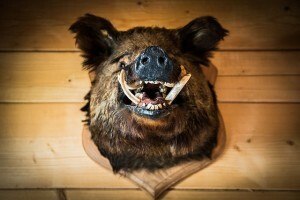 Our 800 acre hunting property features some of the finest wild boar hunting in eastern europe. Tucked beneath a remote section of the Ural mountains, the property features some of the most diverse cover in the area. We also have access to many managed estates in the area where hunting is permitted for our clients. Thick underbrush, woodland scrub oak, and rugged rocky areas are common throughout our hunting land. Wild boar is common throughout the property with deer, also abundant. You can find more info on the type of boar we have here at this site. Mouflon hunts are also possible with the appropriate tags and licenses. The Mouflon in this area are migratory and can be hit or miss depending on the season, weather and climate. 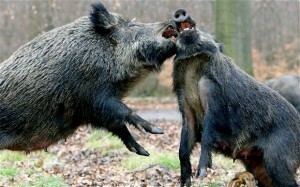 In the U.S. and most of Europe the wild boar is seen as an invasive species with a ravenous appetite and mating cycle that never seems to cease. More info here. We offer a variety of lodging options for both our guided and non guided hunts. Tent Camps: 3 different camps are set up with tents for hunters to reside in. Cooking stoves and heaters are included. Cabins: We have cabins located near the main office, and also situated in the woods closer to the actual hunting stands. Cabin access is included in all guided hunting packages, with availability optional for non-guided hunts. Rifle and Shotgun Hunts – Hunters may choose to hunt with any rifle .223 or larger, and any shotgun 20 gauge or larger. Larger caliber rifles are recommended when hunting from ground blinds. Archery – We offer traditional archery hunts as well as compound bow and crossbow hunts. All archery hunts must be conducted from tree stands unless hunts are guided. Fixed broadheads with 2 to 4 blades are required. Expanding broadheads are not legal in this region of Slovakia. We offer hunters the opportunity to hunt from high seats platforms (or stands) erected on posts or fastened to trees. All stands are permanent and placed in areas where animals are know to frequent. Ground blinds are also an option, with several ground blinds placed throughout the hunting property. Some hunter choosing to hunt without a guide may also use our hang on tree stands if they desire to place a stand in a location where one does not currently exist. When hunting deer or mouflon it can be beneficial to take this approach as these animals tend to move around a lot and can be difficult to pattern depending on what time of the season one is hunting in. Hunting may take place via stand hunting, which is sitting and waiting for boar to happen by naturally, still hunting (rifle only) which entails silently walking through the terrain to stalk within range of a boar, or driven hunts where boar are pressured to flee towards hunters sitting on platforms or in ground blinds. Regardless of what type of hunt you decide to book, we can promise and incredible boar hunting experience on any of our excellent and top rated hunting land. Combination hunts for Reeves Pheasants and boar is also popular. We provide hunts for rifle, shotgun, traditional archery as well as special permit crossbow deer hunting. Many of our hunting property areas feature good cover for both the boar and Reeves Pheasant. The Reeves was introduced back in the 1800’s as a game bird. Since then it has flourished. Most hunts include well trained hunting dogs adept at smelling, tracking and flushing the birds once hunters are within shotgun range. Reeves pheasants are exciting and fun to hunt and reward hunters with some of the best European table fare. European hunters can contact us here, while hunters in America are best suited to make arrangements via our American partner at HuntingLandWisconsin.com. The people there can also assist you if you wish to buy hunting land for sale in Wisconsin and surrounding states in the midwest for use as recreational property, hunting land or for investment and or leasing.